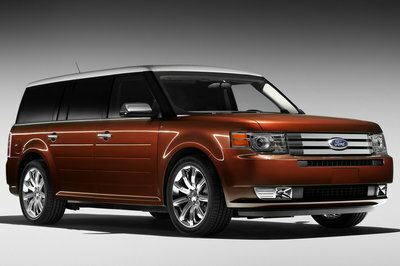 The most visible change at Ford dealerships this year is the addition of the new Ford Flex wagon. The Flex is a purpose built crossover vehicle with three rows of seating and styling guaranteed to draw stares. The unique exterior styling wraps a more conventional interior that still boasts new features like an optional refrigerator console. The Flex comes in SE, SEL, and Limited trim levels. All three feature the same 3.5L V6 and six-speed automatic transmission under the hood. Both front-wheel-drive and all-wheel-drive are offered on all models. The unique Flex can be ordered with a single solid paint color, or choose from several paint schemes with a contrasting white roof. Large 18-inch and 19-inch wheels are also available. With the death of the Chrysler Pacifica and Dodge Magnum wagon, the Flex has few direct peers in the marketplace with the exception of the Ford Taurus X, which is almost exactly the same size. Pricing starts just under $30,000, but can quickly top $40,000 in the upper trim levels. The all-new Flex crossover features three rows of seating accessible through four conventional doors. The Flex is essentially identical in function and size to the Taurus X, but differs wildly in execution and style. The Flex comes in SE, SEL, and Limited trim levels. All three feature the same 3.5L V6 and six-speed automatic transmission under the hood. Both front-wheel-drive and all-wheel-drive are offered on all models.